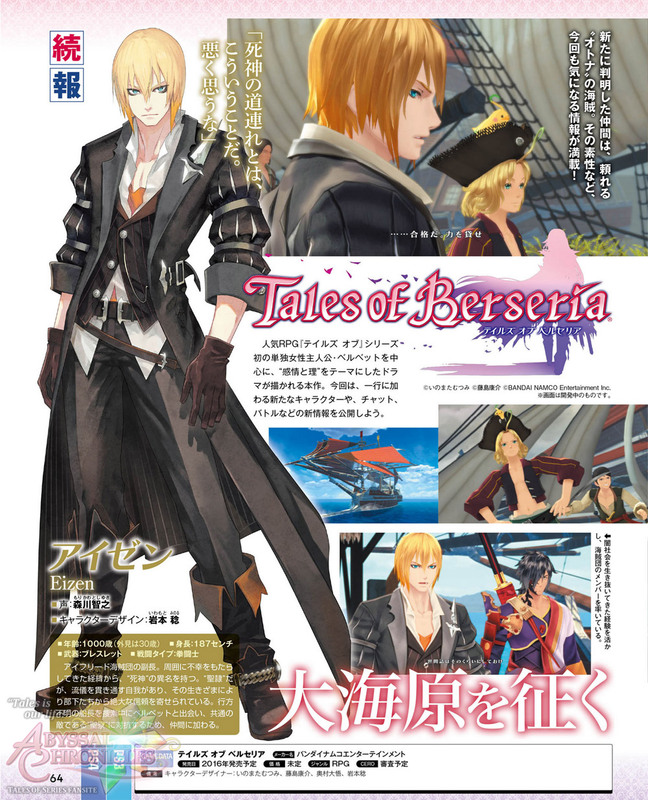 HomeNewsNew Tales of Berseria Scans Feature Eizen, Status Artwork and More! 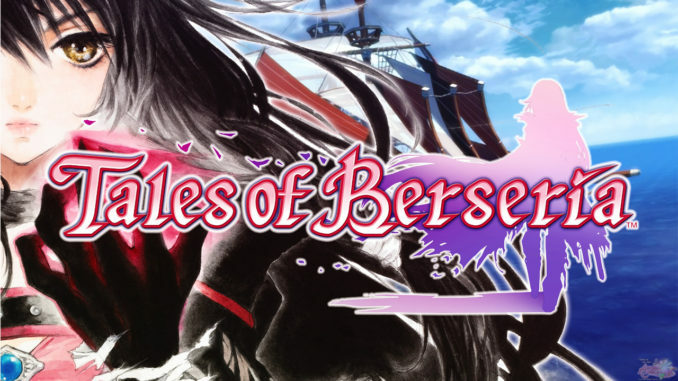 New Tales of Berseria Scans Feature Eizen, Status Artwork and More! 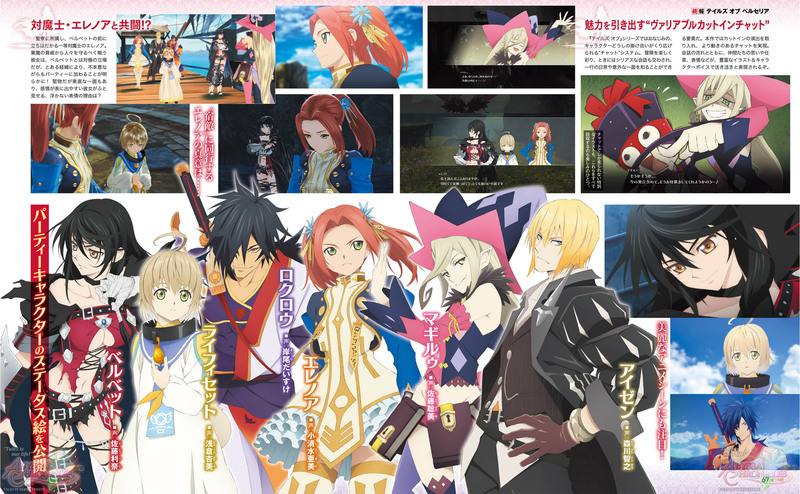 New Tales of Berseria scans from Famitsu feature a bit of new info on recently announced character Eizen, as well as new artwork and anime scenes screenshots. "This is what it means to travel with the Grim Reaper. Don't think badly of me." 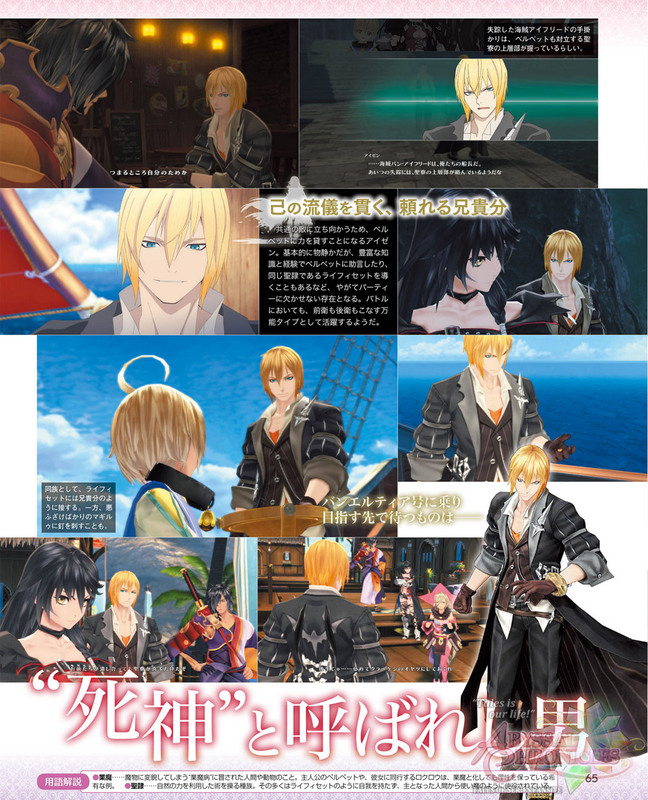 - Eizen is the vice captain of the Aifread Pirates. He is known as the "Grim Reaper" because of the misfortune that happens around him. He meets Velvet while on a search for his missing captain. 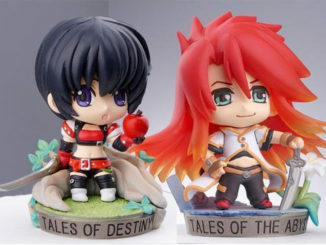 His group is also against the members of the Abbey, hence he joins Velvet on her journey. 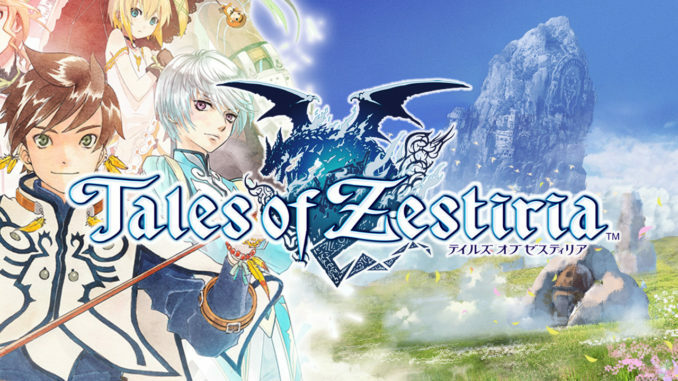 He is a quiet man but is with vast knowledge and experience, sometimes giving Velvet advice on the journey and guiding Laphicet, making Eizen an important member of the party. He treats Laphicet like a brother but keeps an eye on the mischievous Magilou. Though a Malak, he has his own will and cares deeply for his comrades. Apparently, his pirate ship is called the Van Eltia. His captain, Van Aifried, apparently got into trouble with the Abbey. 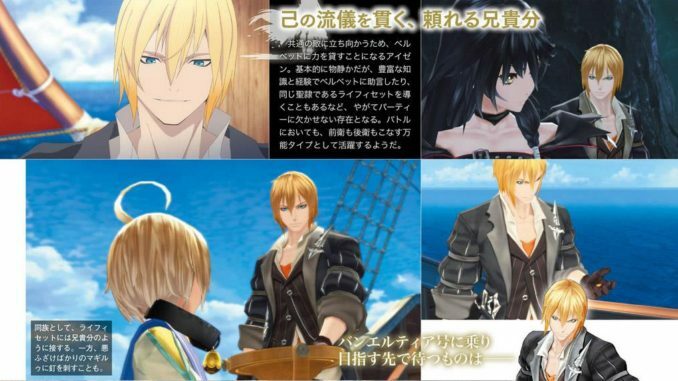 Eizen's Break Soul is "Dragonic Drive," which enables him to stun or stagger enemies. 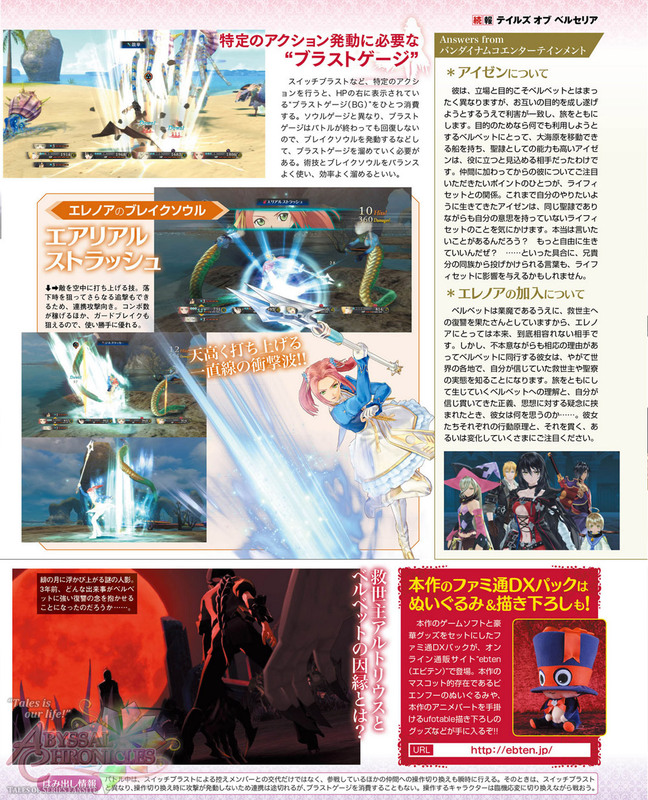 The bottom of this scan also gives a bit of info on the game's beginning story. 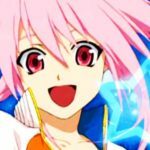 After the events from 3 years ago, Velvet lost everything and is now detained within a prison in an island. The story begins here. After these 3 years, Velvet finds an opportunity to escape, but how will she, given that the island is surrounded by cliffs and the sea? 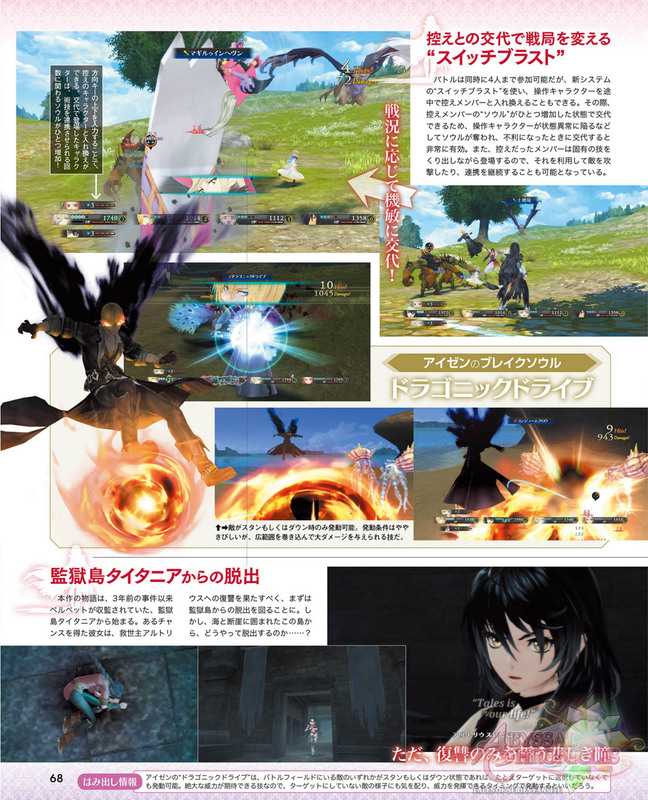 The magazine also confirms Eleanor as a party character at some point, despite her differences with Velvet. 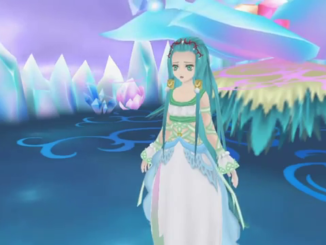 Her Break Soul is Aerial Slash, a technique which launches enemies into the air. 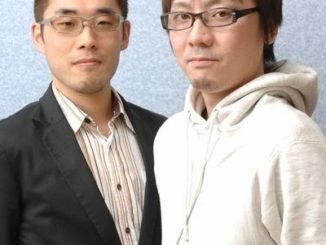 As announced yesterday, the game's Famitsu DX Bundle of the game will include a plush of Bienfu!